How to Invest a Million Dollars | Good Life. Better. 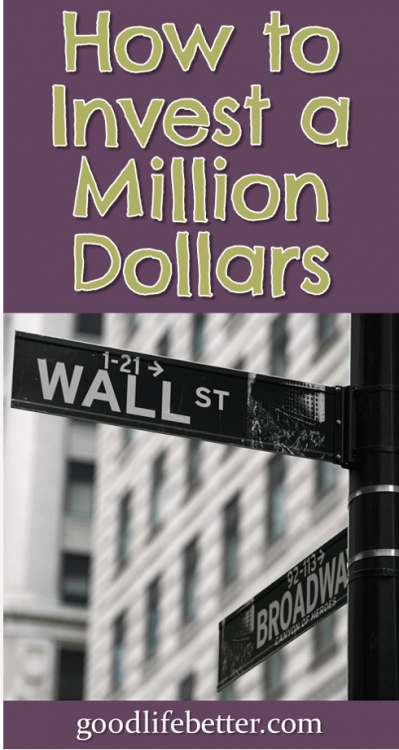 I don’t have the pleasure of personally being in charge of investing a million dollars—yet—so when I came across this competition asking how to invest a million dollars on the blog give. earn. live. I just knew I had to throw my hat in the ring. The instructions were to make specific recommendations and provide an explanation for the chosen strategy. UPDATE: My model portfolio came in third! It won me $11 which means I still have a long way to go before I have a million dollars to invest but even so I am super stoked. Thank you for your support! $50,000 in the best money market fund available at the time (a recent article on bankrate.com pointed to Capital One). I am not a financial planner so please don’t adopt any investment strategy I recommend thinking that it will make you wealthy. Do your own research and discuss it with your financial advisor. It is more fun than you might think! 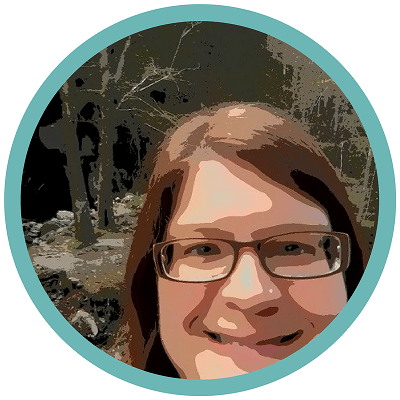 This past summer, I revisited my personal asset allocation strategy in light of my retirement time frame and goals so the strategy I propose here is very much influenced by that research. I am in my early 40s so gave myself a 20 year time frame to reach the amount I would like to have saved before I stop working full time. I feel like I have a high risk tolerance so the strategy may be more aggressive than someone else my age would be comfortable with. Large Cap Domestic Stocks: I suggest 45% in domestic large cap stocks because their long-term performance has been consistent and I would want to see steady growth from this portion of the investment. The two specific funds I name are the Vanguard 500 Index Fund (VOO) and Vanguard Mega Cap Growth ETF (MGK). These funds have good five year fund performance and very low fees. Small Cap Domestic Stocks: I suggest 15% in domestic small cap stocks to create opportunities for growth. The fund I name is the Guggenheim S&P Small Cap Pure Growth ETF (RZG). The ten year performance of the fund is strong and the fees are low. International Stocks: I suggest 15% in international stocks to again create opportunities for growth. The funds I name are Vanguard FTSE Emerging Markets ETF (VWO) and Vanguard FTSE All-World ex-US ETF (VEU). Past performance hasn’t been great but the fees are low and having some international exposure creates balance to all the money invested in domestic stocks in case the U.S. economy goes into the pooper. Real Estate: Also in an effort to create a balanced portfolio, I suggest a 10% investment in the Vanguard REIT Index Fund (VNQ). Real estate isn’t always the greatest investment (remember 2008?) but owning it via an index funds could lesson the blow of any future downturn. Bonds: Traditionally, I haven’t been a huge fan of bonds but they do offer an opportunity to protect a portion of a portfolio from swings in the stock market. As such, I suggest a 10% investment in two bond funds: half in the Vanguard Intermediate-Term Bond ETF (BIV) and half in the Vanguard Long-Term Bond ETF (BLV). 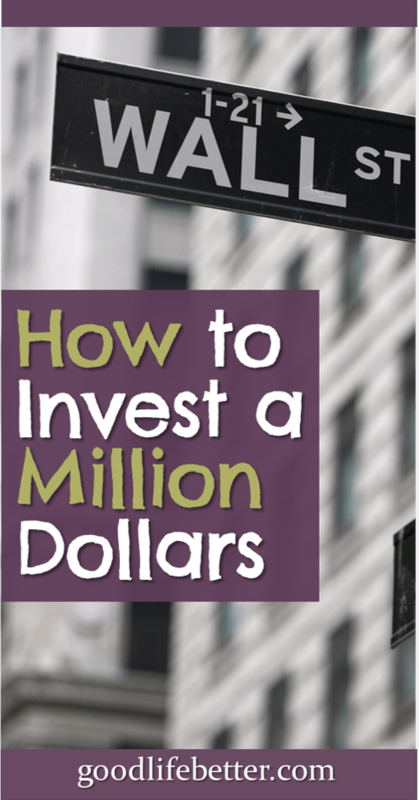 Finally, I suggest 5% be held in cash in the best money market fund available at the time. Several sites—such as bankrate.com or nerdwallet.com—regularly make recommendations on which company is offering the best interest rate so I would start there. I like to think of my investment portfolio in percentages vs. dollar amounts because it makes it easier when it comes time to re-balance, which I do annually. Percentages also help if you are trying to balance across accounts held at two or more companies. I have accounts with my current employer and with TIAA from a previous employer. My current employer doesn’t offer a real estate option and its international option is limited so I can use my TIAA account to invest in those funds. I like to invest time in researching a strategy and then not think about again for a while. This means I am not chasing the newest shiny investment trend. It also means I don’t panic with there is a market fluctuation (and there are always market fluctuations). I believe in my strategy and believe it will help me achieve my goals. As I get closer to retirement—5-8 years out—I plan to revisit my strategy to focus less on growth and more on preservation. 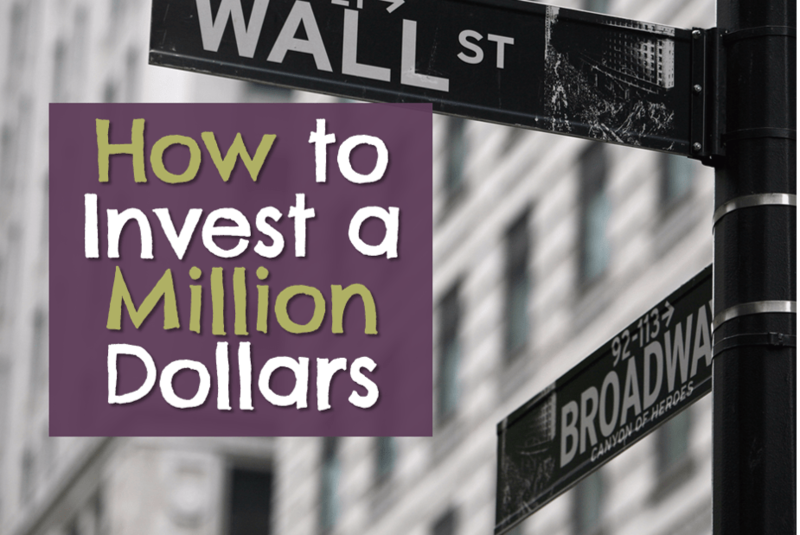 If you were asked how to invest a million dollars, what choices would you make? Let me know if the comment section below.